Nathan Hudson was born perhaps about 1747. Harrie B. Coe, Maine Biographies, enealogical Publishing Co., (2003) , p. 353. "Massachusetts Marriages, 1695-1910," database, FamilySearch (https://familysearch.org/ark:/61903/1:1:FC4F-HQG : 4 December 2014), Nathan Hudson and Betty Gannet, 26 Nov 1767; citing reference ; FHL microfilm 0873752 IT 3. "New Hampshire, Marriages, 1720-1920," index, FamilySearch (https://familysearch.org/pal:/MM9.1.1/FDL3-LFG : accessed 04 Dec 2012), Charles H. Hale and Ellen E. Hughes, 22 Sep 1890; citing reference 2:1GKJ0J8, FHL microfilm 1001264. 1900 United States. Census Office. 12th census, 1900 population census schedules, Washington, District of Columbia: Bureau of the Census Micro-Film Laboratory, ([197-]) , Census Place: Dover Ward 2, Strafford, New Hampshire; Roll: 951; Page: 9B; Enumeration District: 0221; FHL microfilm: 1240951. "New Hampshire, Birth Records, Early to 1900," index and images, FamilySearch (https://familysearch.org/pal:/MM9.1.1/FL5K-RPD : accessed 04 Dec 2012), Maurice Edgar Hale, 06 Mar 1895. "New Hampshire, Birth Records, Early to 1900," index and images, FamilySearch (https://familysearch.org/pal:/MM9.1.1/FL5K-R9Q : accessed 04 Dec 2012), Helen Margrett Hale, 17 Jun 1897. 1910 United States. Bureau of the Census. 13th census, 1910 population census schedules, Washington, District of Columbia: Bureau of Census Micro-Film Lab, ([19--?]) , Census Place: Dover Ward 2, Strafford, New Hampshire; Roll: T624_866; Page: 4B; Enumeration District: 0279; ; FHL microfilm: 1374879. "Maine Marriages, 1771-1907," database, FamilySearch (https://familysearch.org/ark:/61903/1:1:F46C-VYH : 4 December 2014), Claudius M Favor and Margaret L. Humphrey, 09 Oct 1862; citing Portland, Maine, reference ; FHL microfilm 9,784. William Berry Lapham and Silas P. Maxim, History of Paris, Maine: from its settlement to 1880, with a history of the grants of 1736 & 1771, together with personal sketches, a copious genealogical register and an appendix, , at https://books.google.com/books?id=qVMeu3xrioEC . Paris, Maine: Printed for the authors, (1884) , p. 598. Maine State Archives; Cultural Building, 84 State House Station, Augusta, ME 04333-0084; 1892-1907 Vital Records; Roll #: 19. "Maine, Faylene Hutton Cemetery Collection, ca. 1780-1990," database with images, FamilySearch (https://familysearch.org/ark:/61903/1:1:QKMB-BL44 : 16 April 2015), Claude M Favor, 1876; citing Burial, Norway, Oxford, Maine, United States, Maine State Library, Augusta; FHL microfilm 1,769,530. 1880 United States. Census Office. 10th census, 1880 federal population census, Washington, District of Columbia: National Archives and Records Service, ([19--]) , Supvr's Dist: 82, Enum Dist: 162. Page: 8. Line: 41. Dwelling: 97. Family: 101. June, 1895, her son, Norman M. Hunter, was born in Massachusetts. living at East Braintree, Massachusetts. 1880 United States. Bureau of the Census. 10th census, Illinois, 1880 federal census : soundex and population schedules, Washington: The National Archives, ([19--?]) , FHL Film 1254239; National Archives Film T9-0239; Page 217A. 1900 United States. Census Office. 12th census, 1900 population census schedules, Washington, District of Columbia: Bureau of the Census Micro-Film Laboratory, ([197-]) , vol. 55, E.D. 1013, sheet 16, line 47. 1900 United States. Census Office. 12th census, 1900 population census schedules, Washington, District of Columbia: Bureau of the Census Micro-Film Laboratory, ([197-]) , Census Place: Braintree, Norfolk, Massachusetts; Roll: T623_668; Page: 16A; Enumeration District: 1013. Passenger and Crew Lists of Vessels Arriving at New York, New York, 1897-1957, Washington, D.C.: Records of the Immigration and Naturalization Service; National Archives, , Year: 1950; Arrival; Microfilm Serial: T715; Microfilm Roll: 7824; Line: 3; Page Number: 45. Passenger and Crew Lists of Vessels Arriving at New York, New York, 1897-1957, Washington, D.C.: Records of the Immigration and Naturalization Service; National Archives, , Year: 1956; Arrival; Microfilm Serial: T715; Microfilm Roll: 8803; Line: 1; Page Number: 60. Frederick Lewis Weis, The Colby family in early America; early generations of the descendants of Anthony Colby of Boston, Cambridge, Salisbury and Amesbury, Massachusetts, 1595-1661, , at https://books.google.com/books?id=TXdGAAAAMAAJ . Caledonia: The Colonial Press, (1970) , p. 43. "Maine Marriages, 1771-1907," database, FamilySearch (https://familysearch.org/ark:/61903/1:1:F4DR-JWB : 4 December 2014), Samuel Capt. Trussell and Caroline Hupper, 21 Jan 1845; citing St. George, Knox, Maine, reference 24; FHL microfilm 12,070. 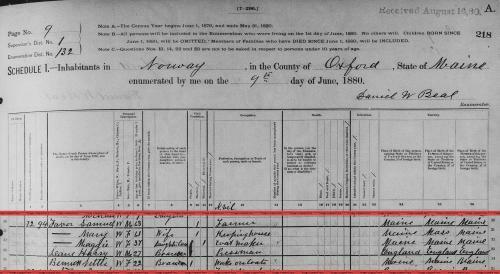 "United States Census, 1850," database with images, FamilySearch (https://familysearch.org/ark:/61903/1:1:M6JY-6DV : 9 November 2014), Samuel Trussel, St. George, Lincoln, Maine, United States; citing family 612, NARA microfilm publication M432 (Washington, D.C.: National Archives and Records Administration, n.d.). Daniel Hurd was born perhaps about 1783. Guy S. Rix, History and Genealogy of the Eastman Family in America, , at https://books.google.com/books?id=mNwRhOz28XgC . Concord, N.H.: (1901) , p. 246. Levi S. Gould, Ancient Middlesex with brief biographical sketches of the men who have served the country officially since its settlement, Somerville Journal Print, (1905) , p. 188. 1900 United States. Census Office. 12th census, 1900 population census schedules, Washington, District of Columbia: Bureau of the Census Micro-Film Laboratory, ([197-]) , Census Place: Winchester, Middlesex, Massachusetts; Roll: 668; Page: 25B; Enumeration District: 0996; FHL microfilm: 1240668. Sally Hurd was born perhaps about 1810, and went to Burke, Vermont. She was the daughter of Daniel Hurd and Anna Eastman. Stephen Hurd was born perhaps about 1808. 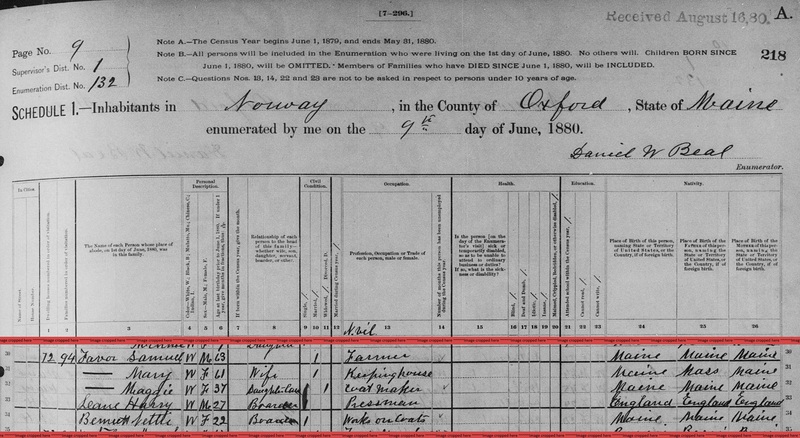 "Massachusetts, Births, 1841-1915," index and images, FamilySearch (https://familysearch.org/pal:/MM9.1.1/FX46-N9H : accessed 05 Nov 2012), Theodore C. Hurd, 1885.
living at 94 Main Street, Winchester, Massachusetts. Samuel Atkins Eliot, A History of Cambridge, Massachusetts, 1630-1913, Cambridge, Mass. : The Cambridge Tribune, (1913) , p. 215. Samuel Atkins Eliot, A History of Cambridge, Massachusetts, 1630-1913, Cambridge, Mass. : The Cambridge Tribune, (1913) , p. 215-6.